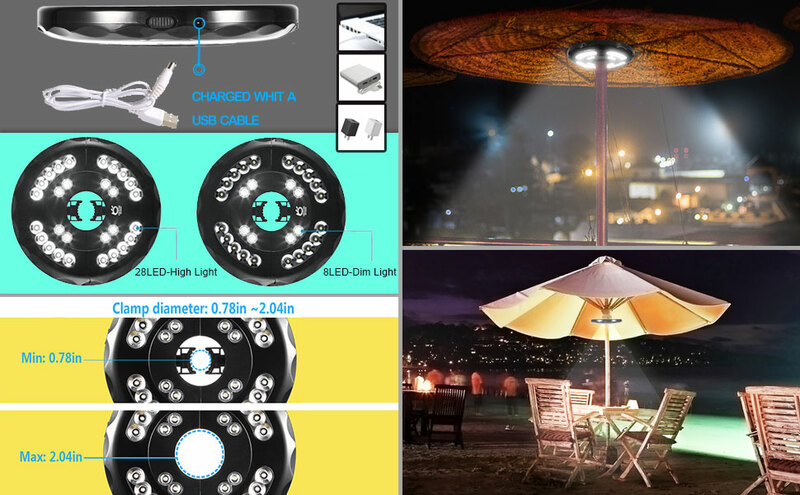 Upgraded patio umbrella light with 28 LEDs, Brighter enough 400Lumens Max, matched USB cable, more convenient to charge though power bank, computer or wall charger. The light with top thick black ABS shell, portable and convenient, you can charge on power bank or notebook power adapter, perfect for outdoor use, camping tent, nightly leisure time and more! 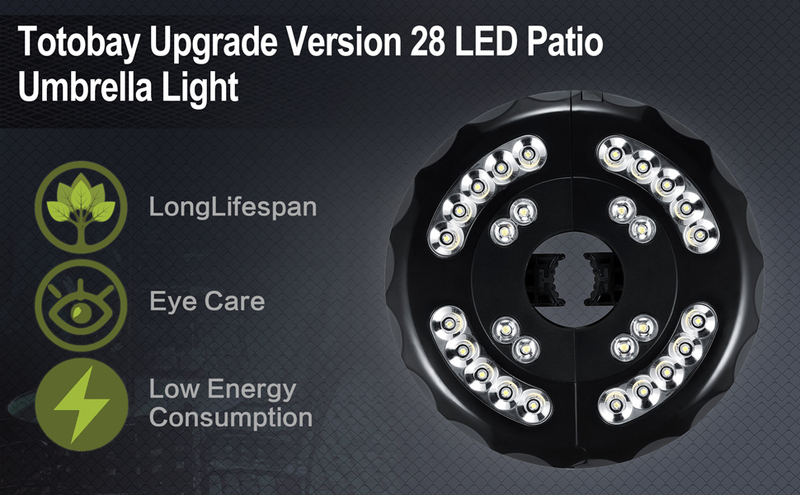 TOTOBAY New Version Patio Umbrella Light with Bright 28 LED Beads, Built-in Rechargeable Batteries, Much Environmental-friendly and Energy – Efficient than Other Old Version. ● Cordless design with built-in flexible auto adjustable clamp, no tools required, just need to clamp to your sunshade. ● With a charging port which is universal for AC Adapter, Computer, Power Bank and so on multiple charging ways. ● Pole mounted fit pole size from (0.78in to 2.04in) in diameter, suitable for most patio umbrellas. ● Suitable for camping, barbecue, play CARDS, or sitting in the yard in the evening with your families or friends, and so on. 1. This patio umbrella light could be recharged by power bank notebook power adapter, it would be about 8 hours. The light will be on 18-54 hours. 2. The batteries are well shielded and need no change. Please do not screw out the cover.